Update! This post was originally published on June 25, 2013. Hurricane season 2014 has been pretty quiet so far, but you never know when a tiny little storm system can gain momentum and become a full-fledged hurricane. Ancient civilizations had to face threats from weather just like we do today, but they didn’t have the amazing technology we have that can track and predict storms. Read our post and learn more about ancient weather and take advantage of our all new activities after the post! It’s summertime and that means lazy days, trips to the beach and no school! It also means Hurricane Season 2013 has arrived. From June to November every year meteorologists pay close attention to areas where severe weather might develop. People who live in states where storms are common like Florida, Louisiana and Texas gather supplies and prepare just in case a major hurricane comes their way. Last year, however, a major storm hit an area that is not used to having hurricanes. Hurricane Sandy made landfall in the Northeast United States including New York City and caused a lot of damage. So, how do we know how many hurricanes there will be this year and where they might land? Scientists gather information from many sources and make predictions based on what they learn. Some of this information comes from the ancient past. Paleotempestology is the study of past storm activity using geology and documentary records. We can look at the land and see where big storms hit areas in the ancient past and actually changed the way the land appears today. In 2004, one researcher in Australia realized that it could help predict storms we might have missed. Dr. Jonathan Nott from the Centre for Disaster Studies at James Cook University reviewed the geological evidence of storms from up to 5500 years ago in Western Australia, Queensland and the U.S. and predicted that “major cyclones bigger than any ever recorded in Australia will hit in the future.” Just as we use weather patterns such as El Nino to make predictions, there are weather patterns from the ancient past that can tell us more about how the weather behaves over hundreds and even thousands of years. Perhaps most importantly, it allows us to see how human beings are potentially affecting our weather patterns and helping to produce a climate in which bigger storms are more common. Did you know that ancient people lived through hurricanes just as we live through today? In fact, Native Americans living along the Atlantic coast during the Middle Ages probably experienced hurricanes similar to our 2005 season. 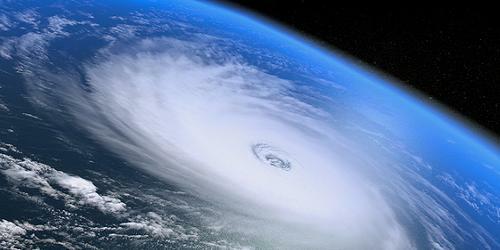 In 2009, Michael Mann, director of the Earth Systems Science Center at Pennsylvania State University, authored a study finding evidence that conditions at the time were perfect for hurricanes. In fact, there is evidence that several hit the coast. His team studied medieval sediments, or soil samples, taken from lagoons between Massachusetts and Puerto Rico and concluded “it was probably a lot like the 2005 season, which was the busiest hurricane season in the Atlantic in recorded history.” They may have even seen a storm just like Hurricane Katrina! Unfortunately, no one in antiquity wrote about these big storms in their diaries so we don’t know exactly what they went through, but we can tell from ancient stories and other writings that they definitely knew all about bad weather. 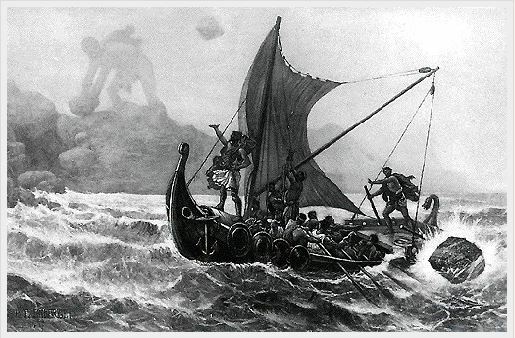 Ancient myths are full of tempests and authors were always trying to write about the biggest and baddest storms. For example, the Greek ships returning from Troy were famously destroyed by a sudden storm that shipwrecked nearly the entire fleet. And then there are the terrible floods written about in texts throughout the world. “Many ancient cultures, the Babylonians, the Mesopotamians, the Sumerians, had stories that involve a great flood sent by a deity, indicating to historians that there was perhaps a (or several) great flood(s) and these myths rose around to explain it (them).” The ancient Greeks tried to explain all weather by assigning each element to a specific god. There was a god in charge of the sun, one for the wind, one for floods and so on. As long as that particular god was happy, the weather would remain fair. If the skies opened up with lightening, thunder, rain or wind, it could all be explained by an angry god. Today, we know that this hurricane season won’t be caused by a grumpy god and no amount of sacrificing to Zeus, Notos or Poseidon will keep the winds, waves and rain away. However, we can rely on the lessons we’ve learned from the ancient past in order to predict and prepare for the storms of the future. So make sure your parents have plenty of fresh water, know your evacuation route and check out the National Hurricane Center’s “Hurricane Preparedness” website for all the info you need to stay safe! Use this fantastic online program to create your very own virtual hurricane! This activity is courtesy of the National Hurricane Center. Click here to get started! Download these printable hurricane tracking charts and use the National Hurricane Center’s website to track storm systems as they travel the map. This entry was posted in Kids Blog, Kids: Meteorology, Kids: Natural Disasters, Kids: Public Life, Kids: Science and Tech, Meteorology, Natural Disasters, Public Life, Science and Technology, Uncategorized and tagged ancient history, AntiquityNOW, Greek mythology, Hurricane Season, meteorology, Native Americans, storms. Bookmark the permalink.